A security incident at San Jose International Airport on Saturday has prompted departing and arriving flights operating out of several gates to be delayed up to two hours, according to the airport. 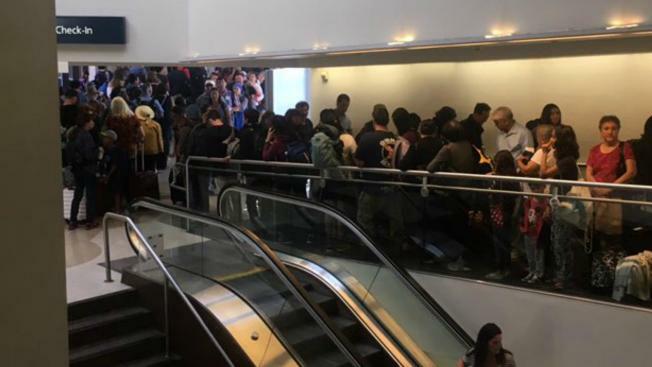 A "security incident" at San Jose International Airport on Saturday prompted departing and arriving flights operating out of several gates to be delayed up to two hours, according to an airport spokesperson. Transportation Security Administration agents around 3 p.m. realized that some prohibited items might have made it into the Terminal A gate area, according to airport spokesperson Rosemary Barnes. As a result, all travelers in the Terminal A area were asked to navigate through security once again for rescreening. In addition to scanning travelers and their belongings, officials thoroughly checked other areas in the terminal to make sure no prohibited items were found, according to Barnes. Approximately 200 passengers in total were asked to leave the terminal and go through security for a second time, according to Barnes. Airport officials announced just after 5:30 p.m. that the terminal was back to normal operating status. Terminal B was not impacted by the incident, Barnes said. Travelers were encouraged to check with their airline for flight status information.